What's the saying? If you'll keg stand for something, you'll fall for anything? Promoters of the Preakness Stakes must believe it. Turns out that Kegasus, spokesbeast for the Preakness and the best mascot in all of sports, is a sham. Our I-Team has learned that the actor who portrays Kegasus—the half-man, half-horse who was "Thoroughbred to party"—is in fact a teetotaler who has done, ahem, anti-drinking commercials! It's another cynical revelation for a nation already weakened through the years by news that Newt Gingrich doesn't really defend marriage and Barry Manilow didn't actually write "I Write the Songs." For the unfamiliar: Since last year, Kegasus has been pushing booze on the masses in his role as "Lord of the InfieldFest." 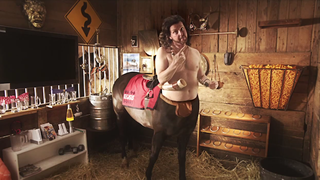 He appeared in commercials featuring a stall with a tapped keg in it; in some spots, he'd hold a big horn as if it were a beer bong. Kegasus hawked the Mug Club, which for $20 grants racetrack patrons a bottomless cup of beer and urged Pimlico infielders, a group that runs atop toilets as a matter of practice, to do something "legendary." He was something of a throwback. Alcoholic promotions all but disappeared from sporting events after the Ten Cent Beer Night Massacre at Cleveland's Municipal Stadium in 1974. But, as the advent of Kegasus proved: They still work! Relive The Majesty And Terror Of "Ten-Cent Beer Night"
He was asked back this year to push Saturday's 137th running of the Preakness. But little info has leaked out about Kegasus away from the stall. Elevation, the marketing firm that came up with the brilliant campaign, won't say much about the man portraying the horse-man. Maybe this is why: He's ... kind of a buzzkill. We've learned that Kegasus is actually John C. Bailey, a Washington D.C.-area actor. It seems that Bailey's off-track work runs counter to the life-coaching dispensed by the beer-gutted dirtball he plays for pay come Preakness season. Bailey also does work for Checkpoint Strikeforce, a multi-state anti-booze effort totally at odds with Kegasus's raison d'etre. The scared-straight ads starring Bailey tell viewers: "Area police are arresting impaired drivers right now!" On his YouTube page blurbing that role, Bailey boasts of being "clean and sober for 20 years." The guy's got an anti-meat agenda, too! Check out the spot he did for something called the Physicians Committee for Responsible Medicine, a clique of fast-food bashers that has demanded President Obama not show up in public "eating unhealthy foods" and whose catchphrase is "Tonight, Make It Vegetarian!" PCRM's even got talking points about the humane treatment of animals! As anybody who's gotten past the pay wall at The New York Times lately can tell you, "humane" is just a synonym for "hates horse racing!" Is it possible that the face (and four legs) of the Preakness hates both beer and the racetrack? Maybe the most disappointing revelation is that John C. Bailey, so charismatic as a horsey hedonist, can be kind of a bore in real life. Reached by phone on Thursday and asked about the Kegasus/sobriety dichotomy, Bailey responded, in deeply unamused tones, "I'm not him," and "I'm flatly denying that I'm him," and a few other similar denials. When reminded that he has listed the role on his own resume, the same paperwork with the phone number that reached him, the Lord of InfieldFest huffed, "I feel I'm being disrespected!" and hung up. By the way, the winner of the Kentucky Derby was I'll Have Another. He's 5-2 in the Preakness morning line. Kegasus would bet on him. Bailey wouldn't. Dave McKenna is a writer in Washington D.C.